Adrian Flux is one of the leading specialist home insurance brokers in the UK and one of only a few able to access a range of insurance options to most owners of properties located in those areas at moderate and high risk of flooding, or which have previously been flooded. If you live in an area deemed to be a high flood risk, or if you have been unlucky enough to have experienced a flood at your property in the past, you will probably have experienced problems getting insurance cover at a reasonable price. That's where Adrian Flux can help. Even if you have experienced a flood before, the Home & Contents cover we offer can help, in many cases, to make sure that your home is adequately covered in the event of a mishap, and at a price you'll like. That's because we can look at every circumstance individually. Our highly-trained staff can investigate the background to each case and are not tied to computer rates or postcode-based exclusions. So, for example, if you live at the top of a hill in a flood-prone district, or if a previously flooded property is now protected by improved defences, the rate offered can reflect this reduced risk. As a result of this case-by-case approach, in most circumstances we can offer a fairly and competitively priced policy and in some cases we can offer a rate where others cannot even quote. Cover is available for many properties within flood insurance risk areas, including listed properties and properties with a history of flooding. Note that quotes are assessed on an individual basis, and our advisors will need to speak to you and ask questions tailored to your own situation. We cannot guarantee to offer a quote in every circumstance, but we do try our best, and have helped many customers in flood-prone areas to insure their properties. Discount when you take Buildings and contents cover. Because homes at risk of flooding are, by their nature, a non-standard insurance risk, all our quotes are based on your individual situation and our staff have a high degree of knowledge in this field. We will always try our best to offer a fair and competitive quote for your circumstances, where possible. 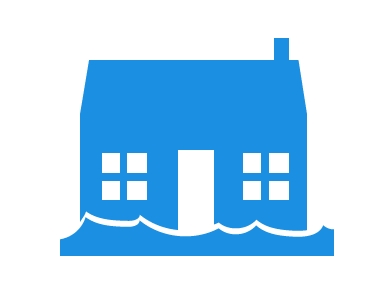 Every flood insurance quote will receive the attentions of a specialist. Each risk will be individually calculated by our expert staff. Please note that our sales staff are insurance experts and with our tailor made schemes for these properties, we believe we offer the best quotation service around. Our flood insurance quotes are only available by phone, please click the button below during office hours (9am to 7pm Monday to Friday & 9am to 4pm Saturday) and we will call you back right now, or at a time you specify, for an immediate flood insurance quote. Cover your family's home legal expenses with a legal protection policy from Adrian Flux designed to save you money and headaches when bringing or disputing claims. Our Policy will cover your legal costs when fighting any disputes around buying or selling your home, nuisance and trespass disputes, your legal costs after damage to your property, costs involved in employment disputes, and much more besides. Click to 'find out more' to see how a family legal protection policy could benefit you and your family, or click 'call me' to arrange a time for our expert team to call you. The spare parts for you car or van can be worth a lot of money, and even a modest modifier or enthusiast can quickly end up with hundreds, if not thousands, of pounds worth of kit for their car. Whether you own a couple of spare tyres, house a whole new engine in your shed, or are part-way through a rebuild of your car, having the right cover can save you money and a headache if anything was stolen. With policies starting at just £12.99, low £50 excesses and cover for up to £10,000 of spares, spare part insurance is a must for any budding mechanic.